Mt. Fitzroy is arguably the most famous landmark in Patagonia It’s situated 12.5km from El Chaltén. 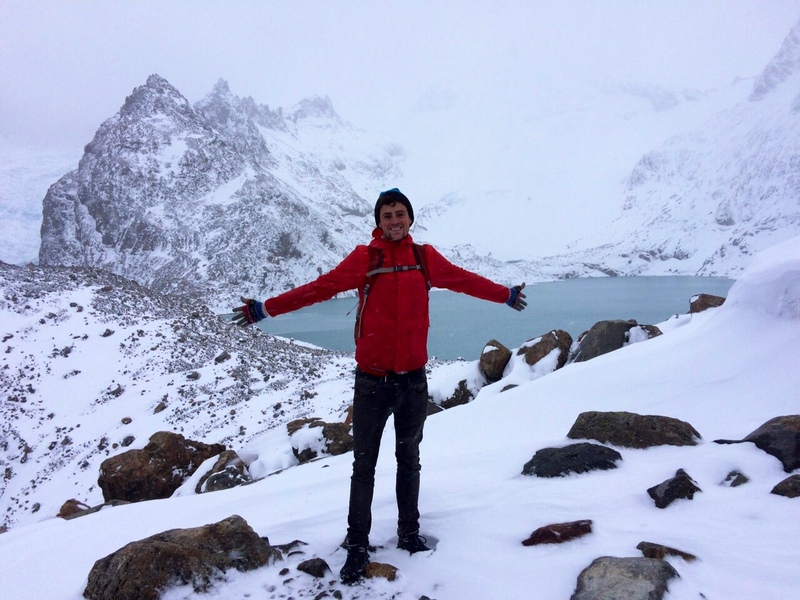 If you’re visiting Patagonia, hiking to Laguna Los Tres [2000m below Fitzroy’s summit] is a must. We arrived in El Chaltén by hitchhiking from El Calafate. We were told by numerous people that hitchhiking is extremely easy and safe in Argentina so we decided to give it a go. Sure enough it was and after two ride and around three hours we arrived in El Chaltén. Alternatively you can get a bus that takes the same amount of time and costs around 120 pesos [$13] but hitching is way more fun. 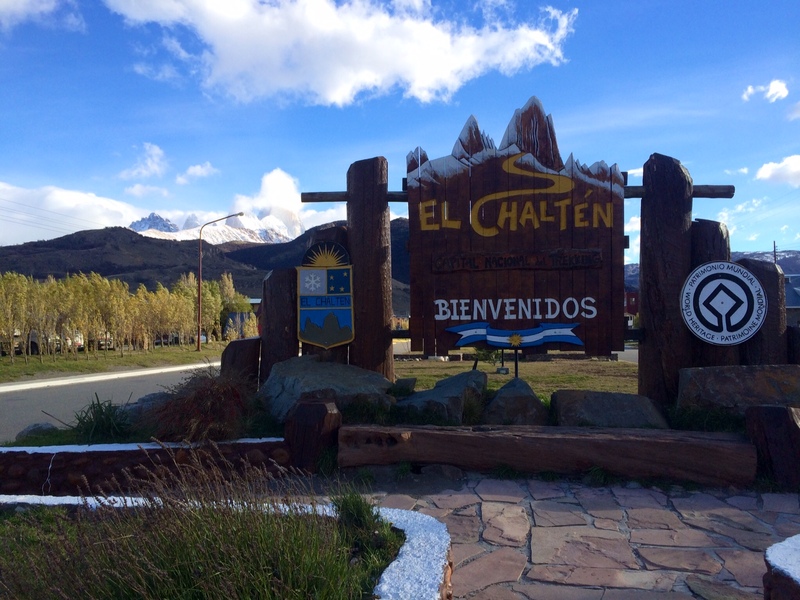 El Chaltén is a sleepy little town and is Argentina’s youngest [created in the late 80s]. In the low season there’s little to do in the town itself. The surrounding national park however is an outdoor lovers paradise with countless trekking, climbing, and camping possibilities. We arrived in mid-May so most of the town was completely deserted apart from a handful of travelers hoping to catch a glimpse of the smoking mountain. Fitzroy was given this nickname due to the fact that the mountain summit is almost always shrouded by cloud and is almost impossible to see unless the weather is perfect. 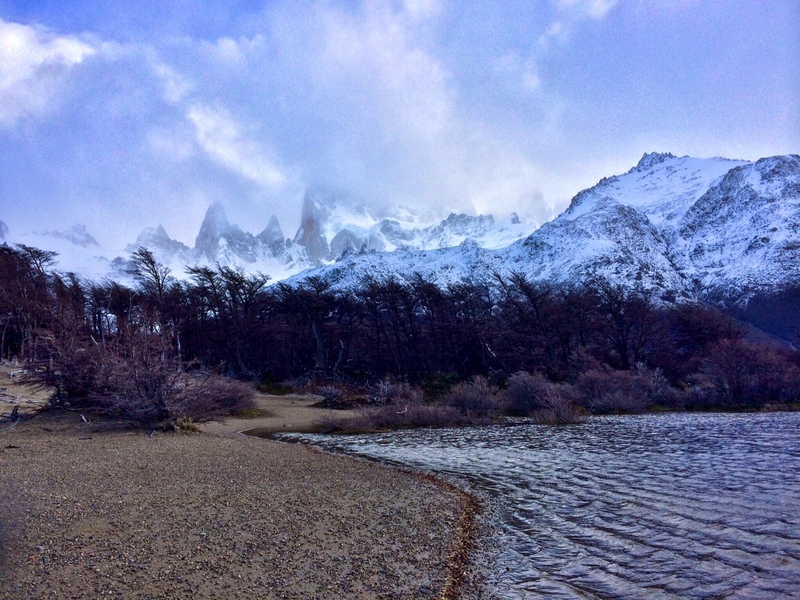 We neglected to check the weather before we left for El Chaltén which meant we spent three days trapped inside waiting for an opportunity to hike to Lago de Los Tres at the base of Fitzroy. I’m pretty sure Tori started developing cabin fever and we tried to break the monotony with small hikes close to town, yet this always ended with us returning to the the hostel frozen and soaked as the storm that seemed to perpetually hover over the town battered us. On the fourth day however we woke to sun shining through the window and the first clear blue sky we’d seen in what felt like an eternity. We knew this was going to be our only opportunity to head to the lake and definitely our best chance to see Fitzroy in all its glory. After a quick breakfast of whatever fruit we could find amongst the meager pickings at the only bare shelved supermarket in town we set off. Lagos de Los Tres is around 12.5km form the center of town which we guessed would take around four hours. The first section of the hike is a relatively steep ascent into dense woodland. Every few meters, gaps in the trees allow you glimpses of the stunning valley below. 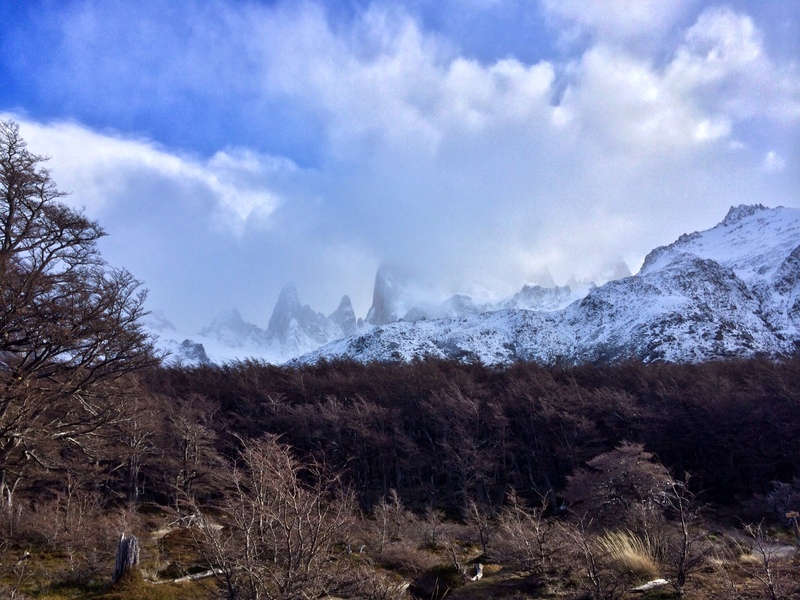 Although the day started with clear blue skies the unpredictable Patagonian weather started to rear its ugly head and seemed determined to prevent us form seeing Fitzroy. Although it didn’t rain, the clouds quickly moved in. About an hour into the trek we passed a new point where a sign indicated that the peak of Fitzroy was visible. All we could see however was a thick grey blanket hovering above the tree-line. Determined to reach the lake and relatively unfazed we continued towards our goal. After around the two hour mark the woodland started to become more and more sparse and we found ourselves at the bottom of the valley below the Fitzroy range with quite some distance still to go. The first thing that hit us after breaking through the tree-line was the wind. The famous Patagonian winds that we’d luckily managed to avoid in Torres Del Paine were ripping through the valley funneled in by the surrounding mountains. The second thing that hit us was the view. From the floor of the valley we had a clear view of the base of the Fitzroy range and the blue hue of glacier Piedras Blancas carving its way through the mountains. On a cloudless day we would’ve had a clear view of the whole Fitzroy range from the valley floor. At this point though we could see little more than the snow covered foothills. For around the next hour we weaved our way down the trail towards our goal. The trail roughly followed the meltwater streams which later join the Rio de Las Vueltas and this section of the hike was a relatively easy, flat hike. The path led us through eerie, dead, black and white forest, over beaches on the banks of the streams and through two campsites. There are many trekking options in the national park so the campsites are a necessity for hikers embarking on multi-day treks. They provide a safe, sheltered place to sleep, wash, and eat. Although we didn’t require the use of the campsites we decided to stop for a snack at the site at the bottom of our final ascent to Lago de Los Tres. As signs indicated we only had 1km to go, and we assumed we’d reach the famous view point with ease. Our nativity was soon apparent as this turned out to be by far the most difficult part of the hike. The last kilometer was what felt like a near vertical ascent. We’d smashed the previous 11.5km in just over 3 hours. This last k took a third of that. For the first 20mins we walked on loose gravel, huge stone steps, mud and frozen streams. 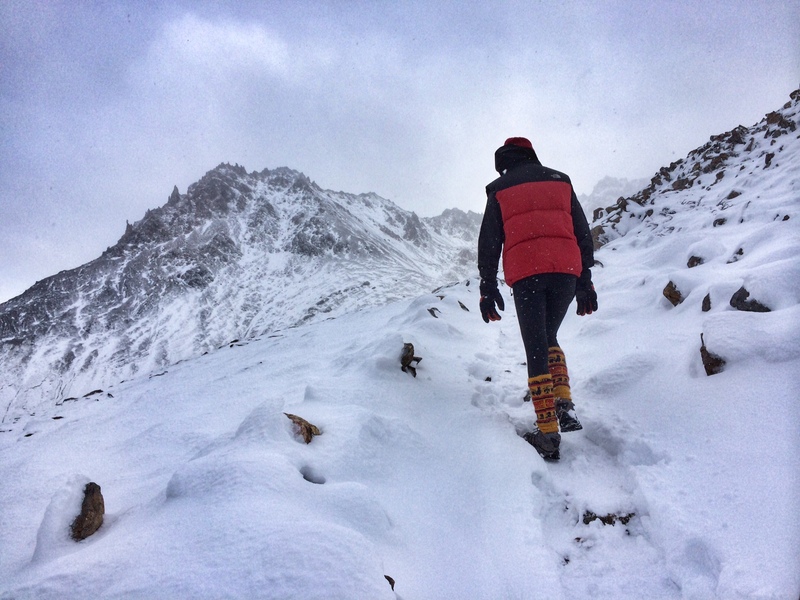 Due to our rapid ascent though the conditions quickly changed and thin layers of frost became knee-deep snow that completely covered the trail. We were definitely underprepared for the conditions and our ankle-high hiking shoes were soon sodden. It didn’t matter though, the scenery was breathtaking. Ahead of us through the clouds and snow were dramatic jagged, snow covered peaks. Below us the woodland, valleys, and rivers stretched as far as you could see. The closer we got to the lake the worse the conditions became and we were soon fighting our way through a full on blizzard. It as literally snowing sideways and the delicate snowflakes became like bullets in the ferocious wind. 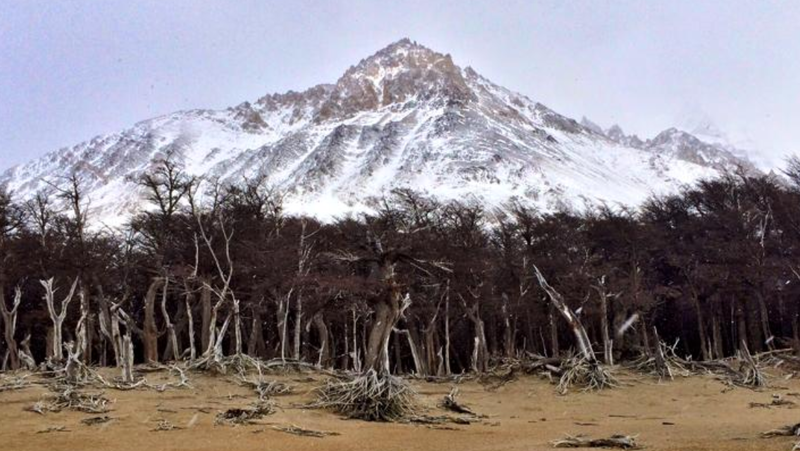 The ridge that surrounds Lago de Los Tres provided us a brief but welcome shelter from the weather. We’d made it to the top. Although the elusive mountain was still hidden behind the clouds the view from the lake was still worth the hike. Of course we were a little disappointed to have been denied a view of Fitzroy from the lake but the whole hike in itself is beautiful and definitely worth a shot. We spent a few minutes at the lake, enjoying the view and snapping photos, but were hesitant to hang around for too long as were worried the weather would worsen. The way down somehow seemed even more slippery than the way up and we took extra care on the snow and ice covered rocks. Once we reached the valley floor we stopped to take a look back at the slope we’d just conquered and to our disbelief the clouds were starting to break. The whole Fitzroy range was slowly being revealed. We started to laugh as it was just our luck. We were caught in a blizzard at the top and were unable to witness Fitzroy from the famous viewpoint, half an hour later however when we’d descended to the valley floor the whole range was becoming visible. During this trip we’ve learned to laugh off such events as our misfortune seems to be a reoccurring theme. We didn’t really care though as the view from below was stunning, we’d been granted a view of the smoking mountain and we were delighted. 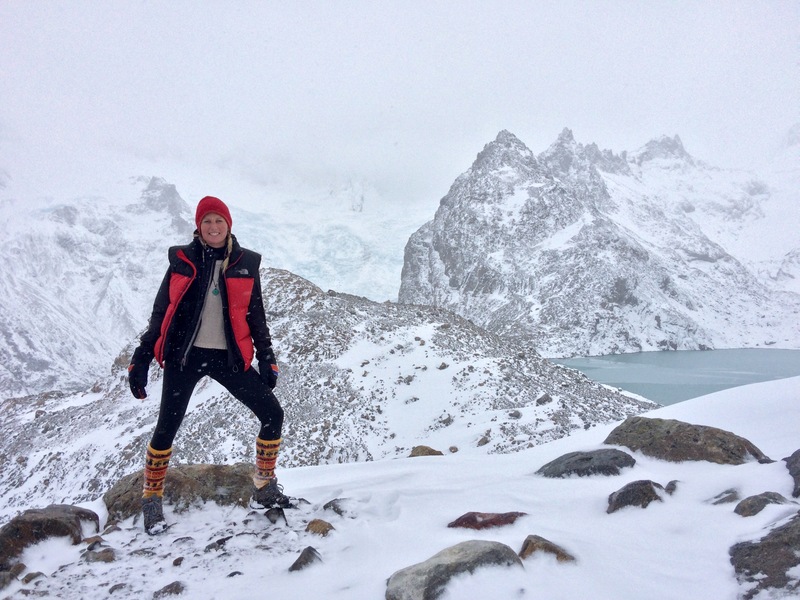 On the way back to El Chaltén we decided to take a different route. The small map we had showed this alternate route to be roughly the same distance as the one we’d taken to reach the base of the lake, but would take us south of the mountain and give us a view of neighboring, 3102m Cerro Torre. Still smiling we set off. Looking over our shoulders every few seconds to take in the epic view. A couple hours into our hike back we realized that our progress, according to the map, was extremely slow. We expected that we were around two thirds of the way back. After pinpointing our location though it turned out that we weren’t even half way. I was determined to get back before the sun went down so we tried to pick up the pace. Our aching legs had different ideas though and we struggled our way through the grassland and woods to the southeast of Fitzroy. During the tiring walk back the views were just as mind-blowing as the way there. We couldn’t help stopping every few minutes to stare in awe at the mountains behind us as the sun set. 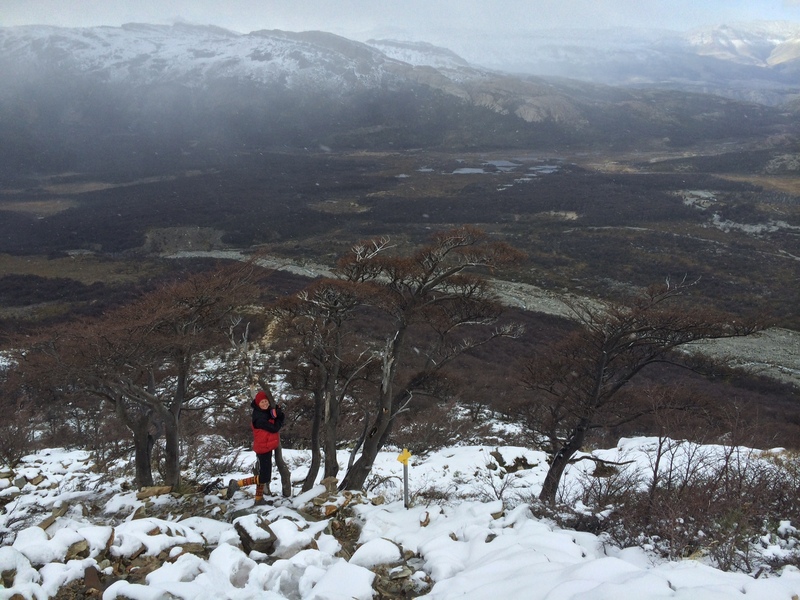 About five hours after leaving the lake we arrived back in sleepy El Chaltén. Our feet were soaked, our legs and backs aching but we’d done it. 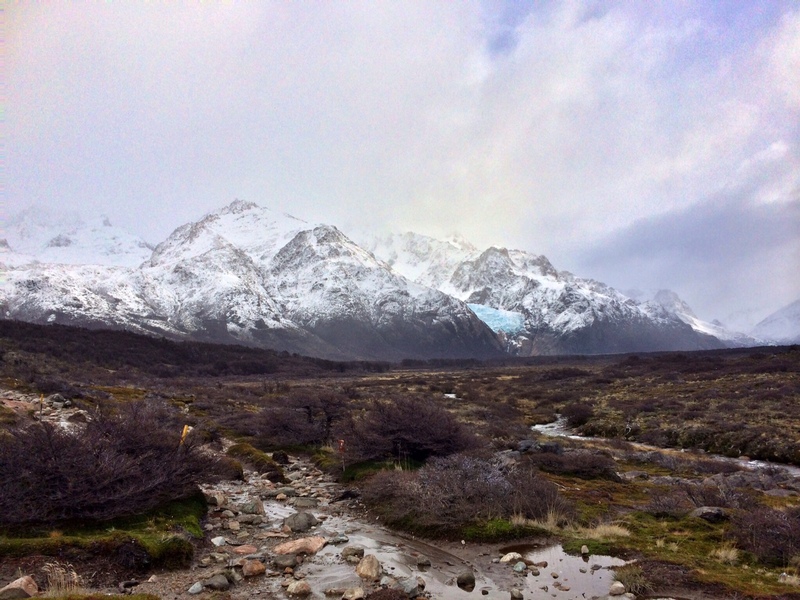 The northern reaches of the Parque National Los Glaciers and the Fitzroy range that looks over it is certainly one of the most beautiful parts of the world we’ve ever witnessed. The end of our time in the Parque also meant the end of our time in Patagonia. And we had to say goodbye to this breathtaking, beautiful part of the wonderful planet we call home.